Telugu Titans beat UP Yoddha 34-29 while U Mumba thrashed Haryana Steelers 53-26 to record their highest ever win in the league. Telugu Titans registered their second consecutive win of Pro Kabaddi Season VI as they beat UP Yoddha 34-29 here on Saturday. It was an all-round effort from the Titans with Rahul Chaudhari and Nilesh Salunke chipping in with raid points. Abozar Mighani and Vishal Bhardwaj kept the UP Yoddha raiders quiet for most part of the match. Prashanth Kumar Rai scored 11 points for UP Yoddha but his effort went in vain. Telugu Titans led 3-0 after three minutes while UP Yoddha opened their account with a tackle point in the fourth minute. Rahul Chaudhari scored a raid point in the 10th minute to give Titans 8-7 lead. UP Yoddha’s raiders found a tough to get going in the first half as they trailed 9-13 after 15 minutes. Rishank Devadiga had three points but didn’t get too much support from the likes of Shrikant Jadhav. 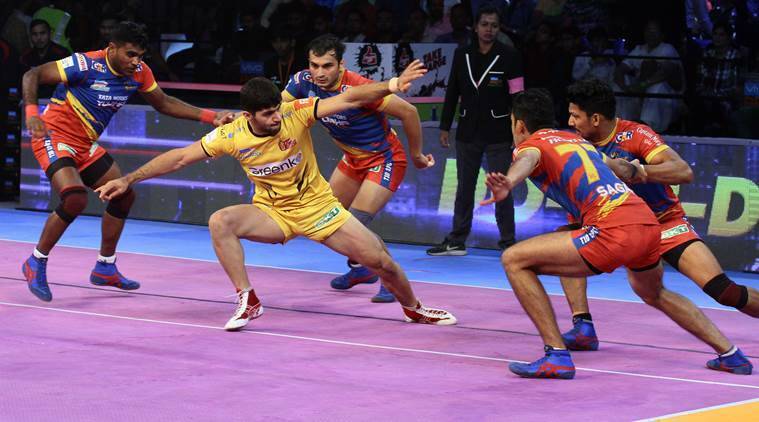 Telugu Titans ended the first half strongly by forcing a super tackle in the 20th minute to lead 18-13 at the break. Abozar Mighani put in a solid defensive shift in the first half and scored four tackle points. Mighani was the fittest and strongest defender on the match as he made tackle points at crucial moments. The second half followed a similar pattern as Telugu Titans led for most of the first 10 minutes. Rishank Devadiga scored with a two-point raid in the 26th minute as UP Yoddha trailed 16-21. With less than three minutes to go, UP Yoddha forced a super tackle and trailed 25-30. Prashanth Kumar Rai came up with the brave moment of the match as he made that tackle which led to the super tackle. For a fleeting moment, it seemed like UP Yoddha might make a comeback as they trailed by four points with just two minutes left. However, Mighani made another crucial tackle in the 39th minute to give Telugu Titans 31-26 lead. Rahul Chaudhari made a super raid in the dying seconds to win 34-29. U Mumba continued their unbeaten streak as they hammered Haryana Steelers 53-26. This was the biggest victory margin for U Mumba in the history of Pro Kabaddi. From the first minute of the match till the last, U Mumba showed their superiority with Abhishek Singh (14 points), Siddharth Desai (8 points) and Fazel Atrachali (7 tackle points) in fine form. Rohit Baliyan also chipped in with eight points. Haryana’s defence had a night to forget as they scored just five tackle points. U Mumba started the match strongly with their raiders Abhishek Singh and Siddharth Desai doing bulk of the scoring. After four minutes, U Mumba led 8-2 with Abhishek Singh looking in fine raiding form. Haryana Steelers struggled to come to terms with U Mumba’s strong start and suffered an all out as early as sixth minute. Haryana Steelers’ star man Monu Goyat had an ineffective first half in which he made just one successful raid. While U Mumba’s raiders were doing a fine job, in defence, Fazel Atrachali stood like a rock. Haryana’s defence also failed to keep U Mumba raiders in check. At the end of the first half U Mumba led 27-15. If first half was disappointing for Haryana, then U Mumba piled more misery on them in the second. An all out was inflicted in the 27th minute and Haryana Steelers looked totally out of sorts. Such was U Mumba’s dominance that in 10 minutes of second half they scored 14 points compared to three by Haryana Steelers. Haryana Steelers substituted Mony Goyat early in the second half and he didn’t come back on the mat again. Abhishek Singh achieved a super 10 in 35th minute as U Mumba led 43-19. In the last five minutes of the match, U Mumba took off their star players and gave their bench strength as did Haryana Steelers. U Mumba inflicted yet another all out in the 39th minute as they led 51-23. Patna Pirates will play against UP Yoddha while Haryana Steelers will face Puneri Paltan in tomorrow’s matches.